The extensive number of projects delivered and installed in more than 60 countries is self-explanating how knowledgeable we are in terms of acoustics solutions. Being acoustics a “science of sound, including its production, transmission, and effects, including biological and psychological effects” (source: Wikipedia) that is largely based on empiric findings on site rather than theoretical equations, it is quite evident how the experience is affecting the final result from any sound-proofing solution. Thousands of installed equipment, successfully commissioned and tested to match acoustics performances, are the best scorecard to prove the value of our noise abatement offering. 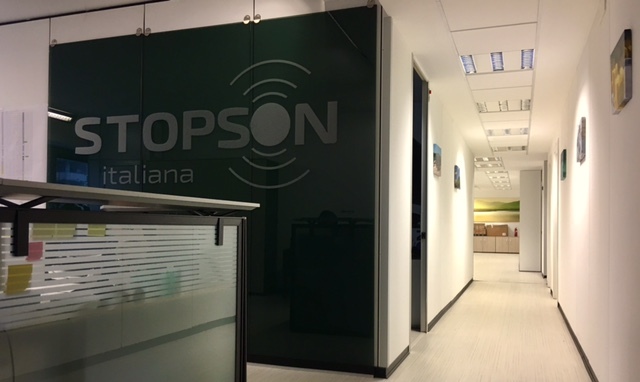 STOPSON ITALIANA has a 25 years old ISO 9001 certification. Quality planning, control, assurance and improvement are the cornerstones of our way to make business on a daily basis. Learning from experience, process tracking, issues analysis and continuous upgrade have made our Quality Management System more effective and reliable throughout the years. We will not stop here, though. We have gone through several third party and customers audits, and we are open to get more: this is our Quality imprint, the only way for success based on clients and suppliers feedback to improve and become a partner of choice. Our history tells the story. It’s all about rigorous design, timely execution, proven results. An effective approach to ensure reliability begins with accurate revision of project specifications and customer requirements. Once the assumptions are disclosed and fully clear, the research for a dedicated solution and product sizing starts. Sharing our engineering findings with our counterparts and making sure the technical design is accepted is key to ensure a successful completion of the project. This is why we strive to be transparent in continuous communication with clients. Full control of manufacturing process in terms of timing and quality is a substantial step during execution phase, as well as ensuring that all project milestones are achieved, including inspection points before final delivery and installation. We have standardized our product offering to the optimum extent in order to make it as much flexible as the requirement from our clients could be. From a fully standard product to a completely customized design, we can respond in a timely manner with the best possible option to match the targeted result. Our engineering team is used to be stressed with high-demanding customer specifications, either in terms of product requirements and volume of project documentation. We are firstly an engineering Company, and we are ready to serve you with engineered solutions. Our long-term experience is helping us in making our product better and better. Thanks to extensive knowledge of the sound-proofing topic, thousands of running plants and our overwhelming attitude for innovation, our product is continuously improving throughout the years. Periodical programs are launched to assess potential development of existing products while evaluating the launch of new product design, as well as new process implementation and re-design of existing ones. Moreover, we have the dimension to be even more flexible and think new solutions against specific client requests: this the innovation content of our products is higher than the average, this why you can get more from us. Performance is key in this market, and we take no risk about that. More than 20.000 installations worldwide have given us the ability to predict the acoustics efficiency of our products and make sure to match the targeted allowances with proper tolerances. Since initial sizing towards final drawing release as well as manufacturing consistency, the aim to reduce the risk of a performance mis-match is top priority for us. After installation, our experts can conduct acoustics performance test and post-test assessment to support clients and end users in any contractual and out-of-contract issue related to noise emission.